Dr. Roby Barrett, in his latest JSOU monograph, provides an overview of the conflicts in early Islam that are still the sources of many conflicts today. Viewing the Islamic world as one entity, or one made up of major sects (Sunni and Shia), is misleading. Islam is a complex religion with a vast history of internal conflict that speaks to contemporary issues today, including discussions on terrorism and radicalism. Dr. Barrett discusses the shifting U.S. role relative to Islam and provides an overview of contemporary Islam, including radicalism and the issue of a fractured community. Islam's internal conflict highlights the reason why Pan-Islamic movements never gain much traction and why radical Islam remains disjointed. Dr. Barrett posits that the West must focus less on Islam as an ideology and more on those local issues that drive the threat. The insights provided by Dr. Barrett in this monograph challenge the reader to rethink how one approaches the challenges in the Middle East. Dr. Mark Moyar outlines the history of the Village Stability Operations (VSO) program and its Afghan partner program, the Afghan Local Police (ALP). Based on years of extensive research within Afghanistan, Dr. Moyar covers VSO and ALP from their inception through the end of VSO and the transition of the ALP to complete Afghan control. He notes that the programs came into existence out of recognition that exclusive reliance on direct-action counterterrorism had been unable to stop the Taliban and other Afghan insurgent groups. He highlights the importance of understanding the human terrain and the strategic context when attempting to mobilize populations against insurgents and explains the challenges of empowering qualified and motivated Afghan leaders at multiple levels. He also emphasizes the importance of USSOF leadership and describes the challenges encountered in transitioning the ALP to complete Afghan control and its implications for the transition of future SOF programs. Mr. Haddick discusses why USSOF and partner nation SOF in the Asia-Pacific region should prepare for expanded regional roles and responsibilities. China's re-emergence as a global power and its pursuit of its security interests has exposed increasing friction between it and its neighbors and the United States. Haddick asserts that a competitive and sustainable response to the looming security challenge in the Asia-Pacific region willinclude not only naval and aerospace components, but also diplomatic, information, political, and economic tools. In addition, U.S. and coalition partners must prepare for the likelihood that the security competition in the region will eventually manifest itself in various forms of irregular and unconventional conflict. U.S. and partner SOF will have critical roles to play in a truly competitive response to the growing security competition in he Asia-Pacific region. The goal of an effective competitive strategy will be to sustain an open-ended peacetime competition with China that successfully perpetuates the current rules-based status quo. Ms. Bronwyn Bruton and Dr. Paul Williams bring their expertise ingovernance, conflict mitigation, and Africa, to this analysis of Somalia's attempts to establish security and build state institutions while facing the Harakat al-Shabaab insurgency. By every measure of state effectiveness-income generation and distribution, execution of the rule of law, and ability to provide basic human security-Somalia has little or no capability. The authors address the roots of Somalia's long-running conflict and examine the often conflicting motivations of the large range of actors: local, national, regional, and international. This context is essential for understanding the evolution and sustainment of Harakat al-Shabaab. With its links to al-Qaeda, Harakat al-Shabaab remains a security challenge for the entire Horn of Africa. While AMISOM's goal was to protect Somalia's weak transitional national government and stabilize the security environment, its mission went well beyond traditional peacekeeping to include warfighting, counterinsurgency operations, and humanitarian assistance. The AMISOM approach may come to characterize future operations in this region. Dr. James Forest's monograph explores lessons and observations from the recent U.S. Special Operations Forces' (SOF) effort to help Ugandan and other African regional forces locate and apprehend Joseph Kony and members of the Lord's Resistance Army (LRA). Dr. Forest examines the context behind the decision to deploy U.S. military advisors to the region and the significant public pressure placed on the Obama administration to do something. Four themes are identified as important for the success or failure of future U.S. military deployments to sub-Saharan Africa: (1) preparations and logistics, (2) perceptions and expectations management, (3) partnerships and relationship management, and (4) policy and politics. He argues that in the case of Uganda it is critical that any successes derived from collaborative operations must be owned by the Ugandans. Dr. Forest's concluding chapter offers some thoughts about further research and implications for policy and SOF education. This report makes a meaningful contribution to the effectiveness of future U.S. SOF teams deploying to sub-Saharan Africa. This monograph analyzes United States Special Operations Forces’ (USSOF) assistance to Colombia in the context of decades of counterinsurgency and counternarcotics operations. While the case of Colombia is often cited as an exemplar of global Special Operations Forces (SOF) foreign engagement, the details of the engagement, and the reasons for its success, have not previously been addressed in a scholarly publication. This study represents the first comprehensive analysis of the persistent SOF engagement in Colombia. It draws upon the collective wisdom of numerous U.S. and Colombian government personnel, and the authors’ own decades of experience in Colombia and other countries where the United States has undertaken prolonged partnership. 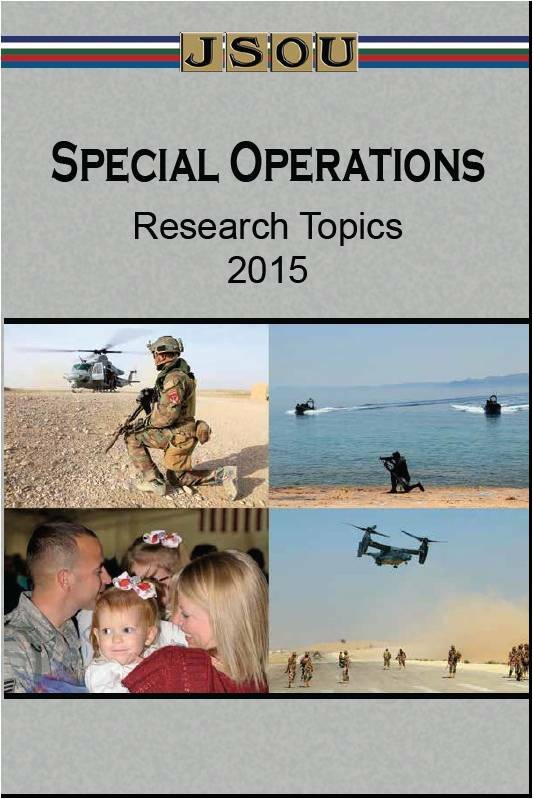 The JSOU Special Operations Research Topics 2015 publication represents a list of SOF-related topics that are recommended for research by those who desire to provide insight and recommendations on issues and challenges facing the SOF enterprise. As with previous year's topics publication, this list is tailored to address the USSOCOM Commander's four lines of operation (LOOs): Win the current fight; the global SOF network; preserve the force and families; and responsive resourcing. SOF PME students research and write on timely, relevant, SOF related topics. Such activity develops the individual's intellect and provides a professional and practical perspective that broadens and frames the insights of other analysts and researchers in regard to these topics. This list and the accompanying topic descriptions are a guide to stimulate interest and thinking. Topics may be narrowed or otherwise modified as deemed necessary (e.g., to suit school requirements or maximize individual interests and experiences. 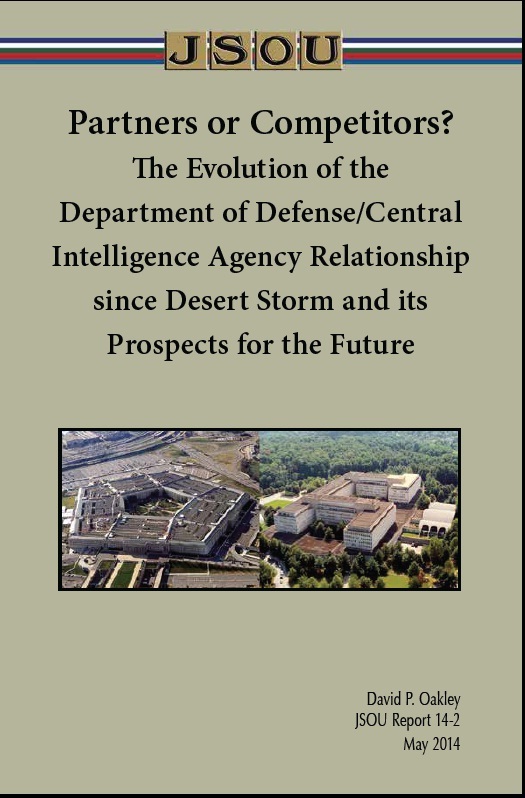 To understand the historical and contemporary context of the CIA/DOD relationship, Major David Oakley draws on secondary sources for his academic research supplemented by primary sources of personal interview with two former Chairmen of the United States Senate Select Committee on Intelligence, interviews with previous and current DOD and CIA leadership, government documents, and written first-person accounts. These primary sources add a new dimension and uniqueness to his research. Although the CIA and DOD relationship expanded significantly following the 9/11 terrorist attacks, its foundation was set 10 years earler in the aftermath of Desert Storm and in the Cold War's twilight glow. During this period, congressional policy pronouncements and organizational changes within institutions increased the communication and liaison partnerships between the CIA and DOD, establishing the foundation for greater interoperability after 1992. These changes established conditions that enabled the blossoming of the relationship since 2001. We are pleased to present this winning essay from the 2014 contest. Each year, JSOU partners with the Special Operations and Low Intensity Conflict (SO/LIC) Chapter of the National Defense Industrial Association (NDIA) to sponsor an annual essay contest. The first-place winner is recognized each year at the NDIA SO/LIC Symposium held in February and also awarded a $1,000 cash prize. The competition is open to resident and nonresident students attending Professional Military Education (PME) institutions and has produced outstanding works on special operations issues. This essay provides an insight on what a recent PME graduate sees as a priority national security issue affecting special operations. 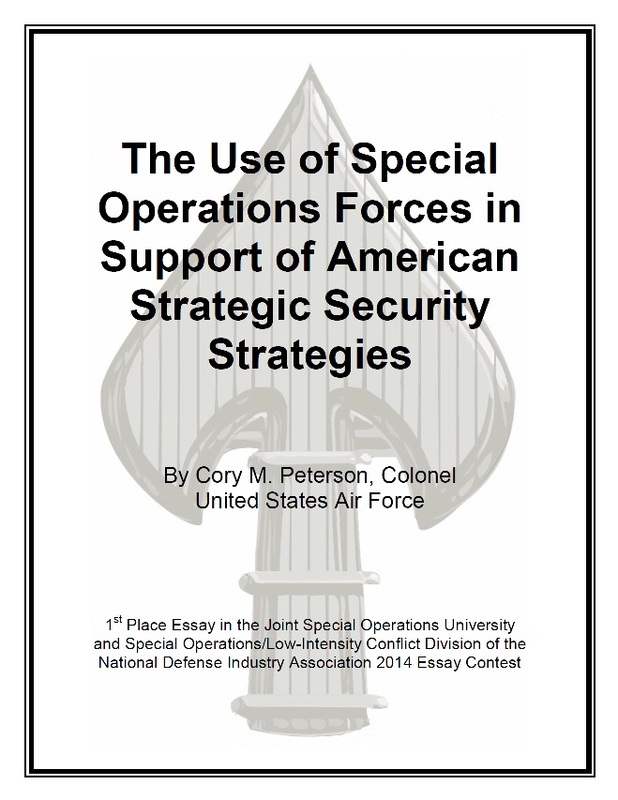 The JSOU intent is that the essays from this annual competition will benefit our readers professionally and encourage future PME students to write on special operations issues. In this report, the authors argue that al-Shabaab's current prospects have probably never been so low.This work provides a meaningful context to al-Shabaab and the Somali milieu. Al Shabaab has been pushed from all of its major strongholds by a robust international effort, and its violent Salafism has alienated many Somalis. But it still has teeth. It continues to harass coalition forces, as well as ordinary Somalis, with improvised explosive devices, suicide bombings, and assassinations. Its tactics reflect a strategic decision made by its leadership to fight a guerrilla war, a familiar role for a group that thrived by waging an anti-Ethiopian insurgency in the mid-2000s. This monograph is a useful resource for anyone who wishes to know more about the conflict in the Horn of Africa.